Please Drive Carefully. Canada's speed limits are in kilometers per hour. 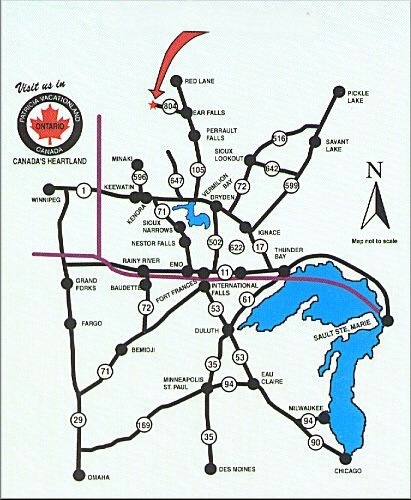 - When you cross the border and clear customs at Fort Frances, Canada get onto HWY 11 East. - Follow HWY 11 to HWY 502 North (approx. 20 miles). - Turn left onto HWY 502 North to Dryden (approx. 130 miles). *** Stop at the Four Seasons Bait Shop at this point to pick up your fishing license and to call the resort. Continue north on HWY 105 and go into Ear Falls (approx. 3 miles) to reach the Bait Shop. 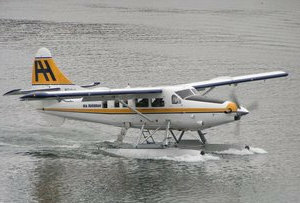 Please call us at 807-727-2481 to let us know that you are on your way to the pickup point.) There are also places to get gas and food further down the road on HWY 105 in Ear Falls. - Return to 804 and turn right. Check your odometer, it is exactly 45 miles to the boat landing/pickup point road. - Follow 804 for 12 miles and you will come to a Y in the road. When you get to the Y, follow it to the right. You are now on a logging road. This road can be rough, so take your time. - Follow this road for 33 miles and turn left onto the boat landing/pickup point road. There are signs for both the resort and the landing at this turn. - Follow the pickup point road to the boat landing, which is at the end of this road. Drive slow, this road can be rough also. - Lodge personnel will be waiting to pick you up. We are closed, but can be reached at our U.S. contact information.